Few things beat the smell of freshly popped popcorn. On the culinary emotive index it has to be pretty close to the top. But it’s not just the feel-good factor that makes popcorn jolly marvelous. As snacks go, it’s a ‘good’ treat, being relatively high in fibre and low in fat too. That’s IF you make it yourself of course, because there is no telling what’s in those pre-packed, pre-sealed microwave popcorn bags, handy though they may be. Fortunately you can have all the convenience of microwave bag-popped popcorn while being in total control of your portion size and calories to boot. 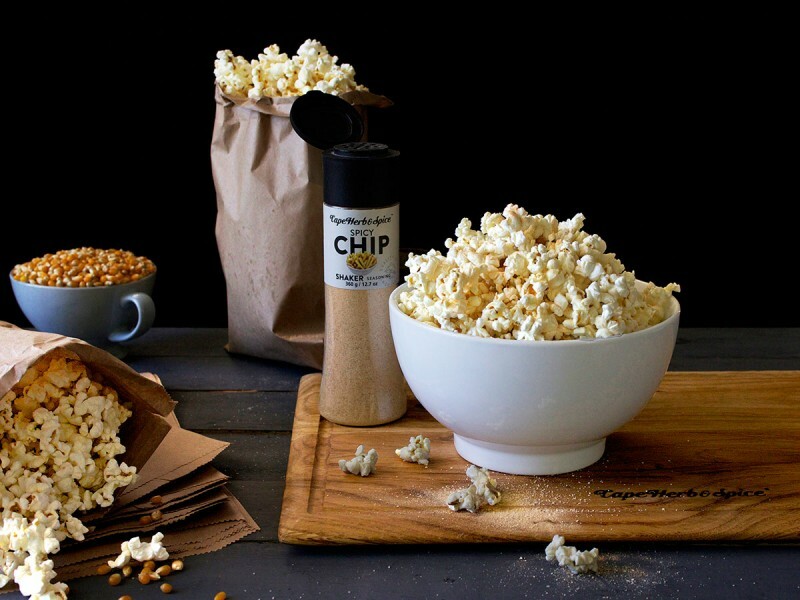 All you need is Cape Herb & Spice’s Spicy Chip Shaker Seasoning, popcorn kernels, the teeniest smidge of oil and… a brown paper bag. It’s foolproof, giving you perfectly popped corn in under three minutes, plus it’s cheap as chips. Fold the open end of the bag closed with a 2cm lip. Give it another 2cm fold, then fold this 2cm-wide lip in half down to 1cm and then over one final time – so you are folding it four times in total. Place the bag in your microwave with the folded lip facing down. I have a powerful microwave and it needed just 2½ minutes to pop perfectly. This will of course differ for each microwave, so start at two minutes and then give it bursts of 10-15 seconds at a time. Once the popping starts slowing down, it’s pretty much done. Open the bag carefully, taking care not to burn should there be any steam, give it a final shake of Spicy Chip Shaker Seasoning and tuck in while it’s still warm. Season whisked eggs with this spice before you make scrambled eggs or an omelette. Slice large unpeeled baking potatoes in big wedges, drizzle lightly with olive oil, dust liberally with the spice, tumble onto a baking tray lined with baking paper (to make washing up easier) and roast at 220 degrees Celsius until browned, crispy and cooked through.